In 1933 when I, James William Biggs, was about 21 years old, I was living in Newland, North Carolina. My dad and I were farmers. We had 50 acres on which we raised cabbage, corn and potatoes. We sold vegetables and certified seed potatoes. It was hard to live in that area of North Carolina because of the cold climate, the isolation of the area, and also because of our Republication president who was starving the country to death. I heard about Roosevelt's new CCC program and I went into the town of Newland, about 2 miles away and signed up for a job with the CCC's. I was given a medical examination. One week prior to the time I was to leave for camp I found out that I was accepted! A "government man" took me to Asheville, NC where I got on a government bus that took us to the Smokies. I had been through the Smokies once before. I was offered a job there since it was the closest CCC Camp to my home and there was so much work to be done there. The Great Smoky Mountains National Park was just getting formed and they were building road, trails, tunnels, rock walls, etc. That is when I first learned to lay rock. I was taught by government employees. My pay was $30 per month. Twenty-five dollars was sent home and I got $5 of my pay. After about 6 months on the job, I was recommended for a raise to $45 per month and I was then allowed to keep $20 of it. I learned a good trade in the camp. My uncle, Wes Johnson (mother's brother) also laid rocks in Avery County. Working with him some, I had gained a little previous experience in rock masonery. In the Camp we had GOOD rocks and GOOD tools (provided by the government). I liked it when you had good tools and rocks to work with. Because of this training, I became a professional rock mason and earned my living doing that for over 40 years. For recreation the government bus would take us to Bryson City to the theater, once a week, on Saturday night. Bryson City was the nearest town. Smokemont was more or less a community, a settlement...no actual town was located there. The camp was nearest Smokemont, but the nearest town to trade and do business was Bryson City. My wife's father, Bill Cline, was also a night watchman at Clingman's Dome for several years while rock work was being done in the Park. Valuable equipment was kep there and it was very important to guard it against theives and vandalism. "Pop Cline" as Bill Cline was called, stayed on the top of the mountain during several winters guarding property of the government. His wife, Ida Dodgion Cline, stayed with him for awhile but found it too cold and dreary for her liking. While working at the CCC's one of the government men took German measels. He lived at Smokemont and it happened in the winter time. I got the measels too. The government took three of us German measel patients in an ambulance all the way to Ft. Oglethorpe, GA. We stopped in Copper Hill, Tennessee and they got us some whiskey, thinking it would help us. We drove on to Ft. Oglethorpe and were confined to the "Measels Ward". The ward was full of people -- 100 or more on cots. Army personnel were jealous of CCC boys and fights would break out. I was stout and I would try to settle the disputes! We stayed there about two weeks. They treated us with shots and pills. 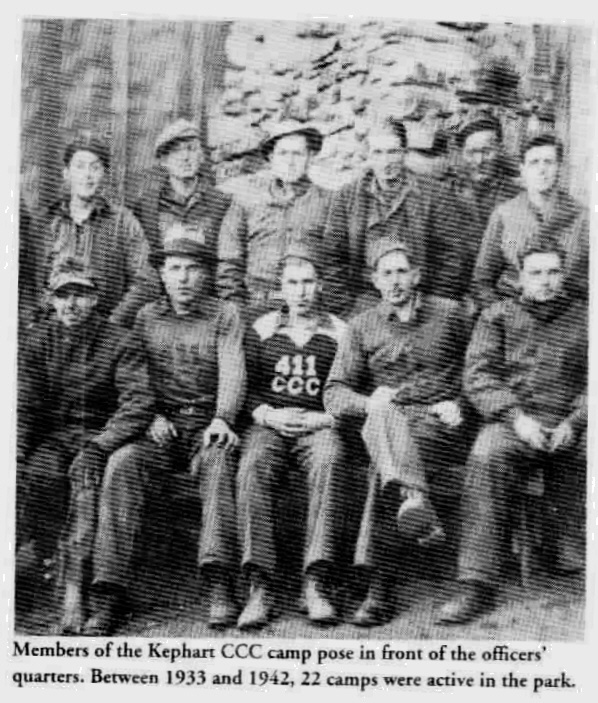 We came back in the ambulance and continued to work in the CCC Camp. In the photo, I am second from the left, front row (the best-looking one!). My shirt says "411 CCC". I was the leader of 10 boys. Ben Cannon is the man beside me who also has on a shirt that says "411 CCC". Next to Ben is Stafford Clark, also from Newland, NC. I recommended him and got him into the CCC's. He lived across the hill from me in Newland. He wore size 13 shoes, size 6 hat, and 32 waist pants. On the back row, second from the left is "Champ" Rice. I stayed in the CCC's for two years and then asked for a discharge. After being discharged, I went back home to Newland for a few months. I had a big bunch of money saved up and so I came over to Bryson City and got married. On November 5, 1935, I married "Pop Cline's" daughter, Ida Wilson Cline. Johnny Hyatt married us at the Ela Baptist Church. I sent someone to a local restaurant and bought $30 worth of food and we all ate outside the church that day. We were married for 56 years until Wilson passed away in 1991.